Actually im writing something here after a long, long time - many months. And not without reason - lack of motivation. i mean, some periods are so fucked up, you just dont get a good time even thinking about them, so so how can writing be any easier. there was not a single thing that went right during that 2005 autocar drag. o second day, we tried something desparate and binned the gear linkage system in favour of a direct weld of the lever onto the shaft. o and that did it - second day was even more of a disaster. o end of second day, even as we turned around for yet another gloomy ride back home, this time having trouble imagining ourselves ever making further plans, we noticed something on a competitors bike which set off a train of thoughts and discussions which brought in a radical change in our way of thinking - and in the bike. o the launches were terrific - tom was quicker off the lights always. o best trap speed - despite a missed gear - was 141kmph. I think even TVS had some trouble with their bikes and vaguely remember they pushing it back to the pits. The RDs ruled once more in the open class, with some smashing runs in the low 13s. anyway to cut a long one short, sunday evening had us packing up, tired and hopeless, on the verge of blaming our riding skills for all that gear misses. tom does point out that even Krishna, who is very much used to drag RDs, couldnt find second gear on our very first drag outing. that line of thought made sense, but didnt do much to help the mood. 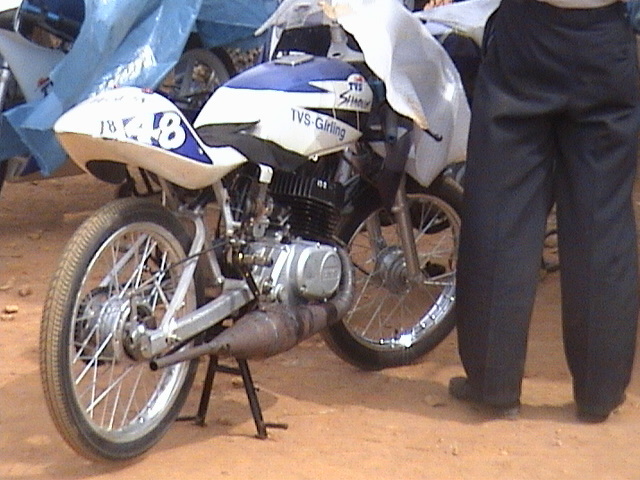 somewhere between 3pm and 4pm, i remember us looking at Haji's bike, and, for the first time, noticing how bloody long the gear shifter was. of course, Haji, like all others, was running a setup - which we ditched on saturday - where the gear shifter sits on the gear shaft and connects to the gear lever through a linkage rod. our gear shifter was hardly an inch long, while the one staring at us from Hajis bike was at least a good 4 inches. and sure as hell i remember Haji smiling at us, walking over, we discussing his setup, and he complaining that he has to upshift like the way on a Yezdi, lifting his whole foot off the lever. of course, the price of torque is play, we agree. play..torque..TORQUE! now something clicked, really clicked, it was like a gunshot. one of our biggest - sorry, bigger; biggest is reserved for later - mistakes dawn on us. we always had setup our linkage for less play rather than more torque and apparently, thats not a good idea. why not, you ask. well so did we, and hurriedly came to a conclusion that well, RDs are that way, you need to setup an RD gear linkage always for leverage etc etc. So we all go back, with hardly any plans for future, except an intense desire to consume maximum beer and pass out somewhere comfortable. having accomplished that without difficulty, we once more settled back into our routine boring life, office and schedules and managers eating into life's beauty. Well should have known - before long Tom is back in gear, and starts bringing in the word "Mumbai" into our general discussions. yeah, the mumbai drag is on, and there is a month to go. but none of us are in an encouraging mood, still being fresh from the last catastrophe. but somehow, at some point of time, we vaguely start making plans. any hope for gear shifts happening was centered mainly around our new "leverage" philosophy for the gear lever setup. one of those days, i remember me playing with the clutch lever rather absent mindedly, lazily mulling over why the damn lever is so stiff. a built in answer popped up equally lazily - of course because its an RD clutch. but as these thoughts looped over, a distant memory slowly lifted itself and offered a simple answer - one of the very first mods we did - after porting the engine - was to install stiffer clutch springs. heck and damn. There is a certian issue with "new" thoughts - when something barges its way into your consious mind, say an idea or a theory or an observation - the sheer "newness" of it, lends it a certian logical "feel" which might, in reality, have no base at all. around this time, we had made and seen enough blunders and i had slowly stopped trusting these "brainwaves". so it was not with much excitement that we settled into a serious exploration of this new avenue of thought. but, like most truths that arrive only after a lifetime of blunders, it started making more and more sense. 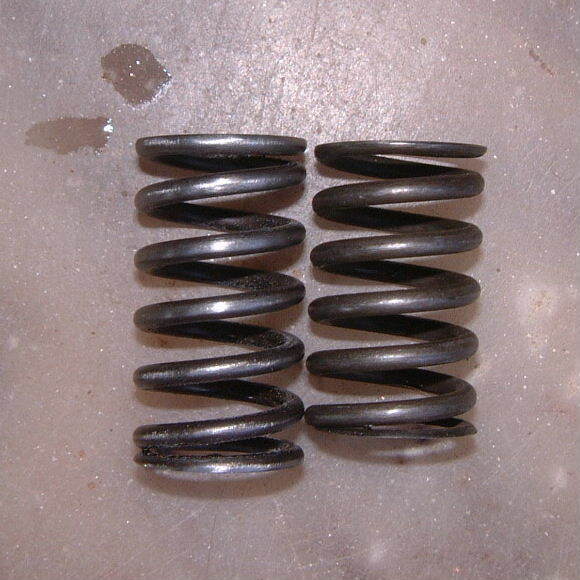 to cut it short - we switched back to normal RD springs within a day or two. By the time stiffer springs were out, it all seemed so bloody obvious, i was almost kicking myself. the stiffer springs were designed for Ron's dragbike - which would make in the range of 70-80 bhp - while we were more at 50-60 bhp, tops. those springs hiding down there in that bottomcase - as well as in our memories - helped us in no way except to prevent the clutch plates from splitting apart when we needed it most - while changing from 1st to 2nd. well, in short, it was Murphy's secret weapon i guess. looking back, at this point i can imagine the grin fading from Murphys face. so we are back in the mood once more, and serious mumbai discussions start happening. both me and Jaggu still arent keen on it, though - we still respect Murphy. anyway a compromise is reached. we plan for a testing session, where tom will do 5 runs. if there is at least one gear miss, we do not go. else we go. so thats the deal, and we have one work to complete - rework the gear linkage for leverage. once thats done, move onto the "tie breaker".